Base jumping has become something of a phenomenon. The sport, which involves jumping from fixed objects from a relatively low height, has thousands of participants – but the law takes a very dim view of it. As Base jumping has grown in popularity, more people have begun to investigate ways to experience the thrill of the sport without breaking the law. We spoke to Alex, a man originally from Scotland, who has set up a Base jumping club with the intention of providing a legal environment in which the sport can thrive. How did you first get into base jumping? I was originally a skydiver. I loved skydiving, and I still do. I started jumping pretty young, and I got quite obsessed. I notched up a couple of hundred skydives, and then realised that actually I wasn’t getting the same sort of thrill from it. Obviously I had heard of Base jumping, and I had friends who had taken it up. So they took me along, and eventually I gave it a go. I jumped once, and I never looked back. So originally you were doing illegal jumps? I wasn’t, no, but plenty of my friends did. They still do, actually. The thing about Base jumping is that it isn’t necessarily illegal – it’s all about where you jump from. The clue is in the title. ‘Base’ stands for building, antenna, span, and earth. The first three are pretty much all illegal. But it is often possible to jump from ‘earth’ objects without breaking the law. In fact, that’s how Base jumping started, back in the ‘70s. What persuaded you to start your club? 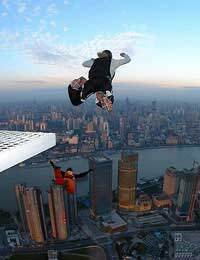 From the very beginning I absolutely loved Base jumping. I adore skydiving, but Base gives you a sensation that you just don’t get anywhere else. But at the same time, unlike some of my friends, I wasn’t comfortable breaking the law. I wanted to create an environment where people obviously were aware of the risks, but where they could do it without fear of being arrested when they hit the ground. So I started investigating places where it is legal to jump, and organising trips for some of my friends. It was very low key at first – basically just suggesting places that we might like to go. Then it grew into something bigger, and we now have regular meetings and regular jumps. We travel all over Europe, and we’ve found a pretty huge number of amazing places to jump from. The popularity of the club has really taken me by surprise. As I say, it started off low key, just as a way for me to get people into legal jumping. Now that I’ve realised the potential, though, I’m aiming to make it a viable commercial prospect. I’m going to start organising paid-for trips to places like Norway, where Base jumping is looked at much more favourably. I think there’s definitely a market for this sort of trip, particularly if we can do it affordably.